Originating from Switzerland, a traditional fondue consists of melting cheese in a communal pot, and using long forks to dip cubes of bread into it. And although you can experience this centuries-old dish around Manila, there are lots of modern versions you can try too—from Korean to American flavors, and beyond. To help you get your cheesy fix, here’s a list of restaurants in the metro, where you can get your dip on. This contemporary Korean restaurant brands itself as a “chicken house.” But the real star of its menu is the fondue. Made with ingredients sourced from the motherland, the fondue is served in a bread bowl, surrounded by chicken chunks in Yang Nyum Sauce, onion rings, and fries. With branches in Ortigas, Makati, and BGC, this is the perfect place for cheese lovers to unwind after work. Head over to Old Swiss Inn to try a variety of traditional fondues. They serve the classic Waatlander Fondue—where bread cubes are dipped in melted gruyere and emmental. However, they also have another cheesy option known as Walliser Fondue. This consists of three cheeses melted in Swiss wine, and enjoyed with fresh tomatoes, baby potatoes, and assorted vegetables. The place to go for a cute date night, this Swiss restaurant in Makati has cozy interiors and not one, but five fondue sets on menu. Fondues they serve here that you won’t be able to find anywhere else in the metro, include: the Genfer Fondue, which blends cheese with morel mushrooms; the Moitié-Moitié Fondue, which features a rare vacherin cheese; and a beef fondue, which is dipped in six homemade sauces instead of cheese. If you’re not into any of the fancy stuff, and just want a big ol’ bowl of melted cheese to scarf down with some crispy snacks, head over to the Maginhawa Food Park. At the Cheese-o-holic stall, you can get a bread bowl of gooey cheese, served with bacon-wrapped sausage, chicken pops, and fat potato wedges. With a 23-paged menu, the “fondue” that Yoree serves can be easily overlooked. But that would be a mistake! Under their Main Course section, the Cheesy Dak Kanjeong and Cheesy Buldak are everything you want in a fondue: delicious things to dip in melted cheese. The Dak Kanjeong consists of sweet and spicy fried chicken, and a number of sides, to be dipped in melted mozzarella and cheddar. While the Buldak offers a spicier twist. Tender marinated beef, rice cakes, thinly sliced potatoes, fluffy omelette, buttered corn, and fresh vegetables—all to be dipped in a pool of melted cheese. 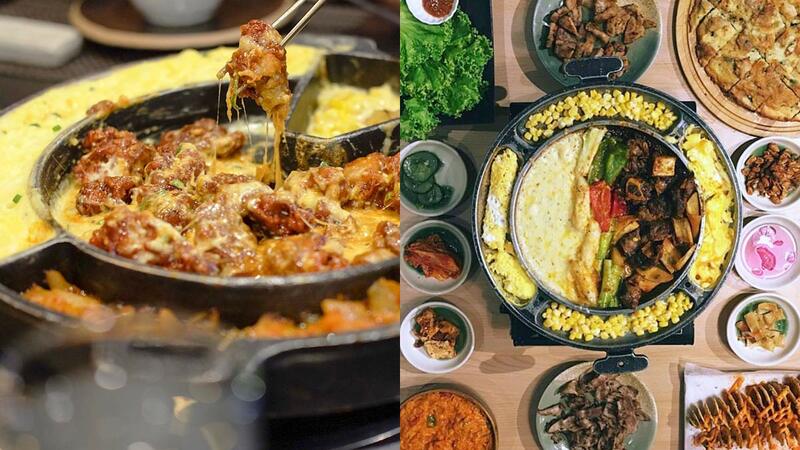 Sibyulee’s Galbi Cheese BBQ set is good for two to four people, so bring friends! They also offer chicken and pork belly versions for variety.